If you were disappointed by the size of SimCity's metropoli (metropolises? ), your eyes are about to bulge from your head. And I mean that literally: the above teaser trailer has been known to cause eye-bulge, so watch it at your own risk. 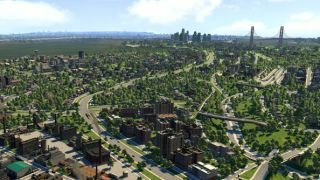 Cities XXL is the latest game from the folks that made Cities XL, and if that extra X didn't clue you in, it's aiming to renew its position as the "world's largest city builder". "Cities XXL features low-level city management mechanics, such as local air and noise pollution levels illustrated with the new stream-lined UI, and beauty hot-spots suitable for holiday locations to supplement cash-flow. At citizen management level, you'll be able to track a person's route to work in order to best manage transport from sea, underground and over-ground rail, or air. Cut-down on traffic queues with the park and ride and buses, or even bike hire—reducing that carbon footprint!" If, like me, you find the naming conventions of citybuilding games a tad confusing, know that Cities XXL bears no relation to Cities: Skylines, Colossal Order's similarly promising, but less embiggened, game of metropolitan management and building placement. Either way, fans of citybuilders are going to be spoilt for choice next year.